My name is Pearl, and I am a Mobile Court Advocate for A New Leaf, helping survivors of domestic violence find protection and security – or whatever else they may need – through the courts. As a survivor of domestic violence, I choose this career because I want to empower people who are facing what I faced. My job means that I meet women at specific courts across the West Valley, going where I am needed most. Most services won’t come to you, especially multilingual ones, but they can call me. This is especially important for survivors that are staying at a shelter and have no other options. Making legal resources immediately available makes it far more likely for the women to seek help and leave their abuser. If you have ongoing questions or forgot to ask something, you can always reach out to a court advocate like me and get a quick answer. You get peace of mind and can ask for help. For those who don’t know, the court can be very intimidating and uncertain. Most survivors are afraid of even starting the process. The most common misunderstanding I see is when people think that their partner will be notified once paperwork is filed for protection from an abuser. They are afraid of making things worse, but that is not the case, you can get the order of protection and have it served before the other person is notified. The unknown is just such a challenge for survivors in the courts, so they usually don’t use them. Having someone there to guide you can make all the difference. Remember, in a DV situation, you have so many troubles on your mind - where will you sleep tonight? How are you going to provide for your children? Are you even safe yet? – all of these serious concerns can distract survivors from getting the outcomes that they need. Language is also a huge obstacle, particularly for survivors filing paperwork. Often there are no resources for these individuals, creating a huge obstacle to finding help. Abusers will often isolate their partners to keep them from finding help. Having a bilingual Court Advocate makes a huge difference since they don’t need to rely on family or friends to interpret, potentially alerting their partner. 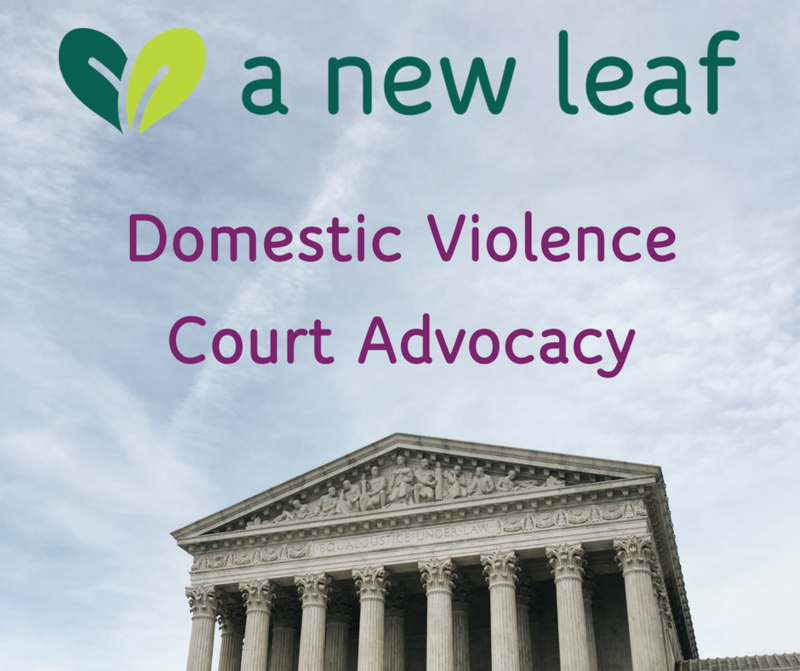 A New Leaf’s Mobile Court Advocacy program is a great resource for people experiencing domestic violence. It is truly such an intimate crime, and the last thing anyone want to do is ask another person for help, let alone an institution. It is so hard, and anything to make the process easier is so critical. I always think that if I had gotten assistance like this sooner, perhaps I wouldn’t have been in an domestic violence situation for so long.